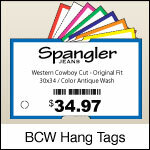 The BCW DT Hang Tag is a direct thermal hang tag compatible with all industrial printers that use a 3" core tag. The BCW DT Hang Tag is a smooth, coated paper tag stock that produces high-quality black bar codes and human readable fonts. No ribbon required. 1.25" x 2.25" direct thermal, 7.5 mil tag on a 3" x 8" core. 2250 labels per roll / 4 rolls per case. BCW 1385100 special features - Perforated. No ribbon required. 2.25" x 1.38" direct thermal, 7.5 mil tag on a 3" x 8" core. 3700 labels per roll / 4 rolls per case. BCW 1385115 special features - Perforated. No ribbon required. 3.00" x 4.00" direct thermal, 7.5 mil tag on a 3" x 8" core. 1200 labels per roll / 4 rolls per case. BCW 1385175 special features - Perforated. No ribbon required. 4.00" x 3.00" direct thermal, 7.5 mil tag on a 3" x 8" core. 1600 labels per roll / 4 rolls per case. BCW 1385250 special features - Perforated. No ribbon required. 4.00" x 6.00" direct thermal, 7.5 mil tag on a 3" x 8" core. 800 labels per roll / 4 rolls per case. BCW 1385295 special features - Perforated. No ribbon required.